With gluten-free ginger snap cookies as their base, these mini cheesecakes are easy and delicious. A classic cheesecake is creamy, smooth and slightly dense without cloying sweetness. The simple ingredients have integrity: cream cheese, sugar, eggs and vanilla. An honest cheesecake wouldn’t disgrace itself by being smothered in a sickeningly sweet strawberry sauce. 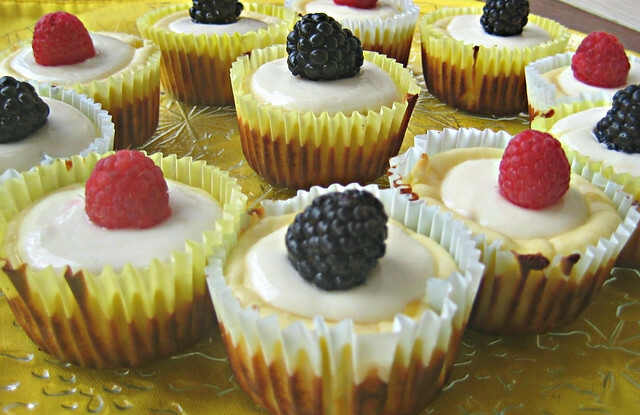 Preparation of these mini gluten-free cheesecakes — adapted from Bette Hagman’s Gluten-Free Gourmet cookbook — is as simple as the ingredients. Gluten-free ginger snap cookies serve as the base. (I usually use Mi-Del gluten-free ginger snaps or Trader Joe’s gluten-free ginger snaps.) A light creamy topping conveniently hides any cracks in the top of the cheesecakes. These cute-as-a-cupcake treats are a perfect dairy dessert for Shavuot. On Shavuot, when we celebrate the giving of the Torah, dairy foods traditionally are eaten. 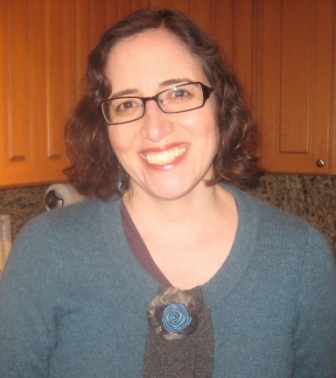 For other dairy Shavuot recipes, check out the Kosher Connection bloggers by clicking on the icon below. Please note that not all of the recipes are gluten-free. Preheat oven to 325 degrees. Line 12 standard muffin cups with paper liners. Place a ginger snap cookie, flat side down, into the bottom of each cup. In the bowl of a stand mixer, beat cream cheese and sugar until well-combined, occasionally scraping down the sides of the bowl. Mix in eggs one at a time, beating just until each egg is incorporated and there are no lumps (you don’t want the batter to be too airy). Stir in the vanilla extract and lemon zest. Pour batter into lined muffin cups, filling each 3/4 full. 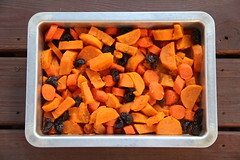 Bake for 25 to 30 minutes until the centers are mostly firm; remove from the oven. Prepare the topping. In a medium bowl, stir together the Greek yogurt, sugar and vanilla extract until smooth. Spoon 1 tablespoon of yogurt mixture onto the top of each mini cheesecake. Return pan to the oven and bake for an additional 5 to 8 minutes until topping is set. Immediately garnish the mini cheesecakes with fresh raspberries, sliced strawberries or any other topping that hits your fancy. Refrigerate mini cheesecakes for at least 1 hour before serving. Store in the refrigerator.